If your digital TV antenna is not working as expected, try the following tips: 1. Check to make sure you have correctly connected the digital TV antenna to your HDTV or third-party HD receiver. 2. Re-scan for channels: In the TV's setup menu set the mode to indoor TV antenna or air. Refer to the TV manual for detailed instructions. 3. Reposition the indoor TV antenna in a different location. It is suggested place it higher on a wall or closer to a window. Sometimes moving a few feet can make a difference. 4. Keep the TV antenna away from those big power consumption devices interference, such as air conditioner, refrigerator and microwave oven, etc. 5. This is an amplified HDTV antenna. If a signal cannot be received with the external amplifier, remove the amplifier and try again. Indoor Amplified TV Antenna - The antenna is a 50 mile long range multi-directional indoor amplified TV antenna with an embedded digital TV antenna amplifier, attached mini coax cable and USB power cable with 110v adapter. The Amped receives both VHF and UHF signals in HD. 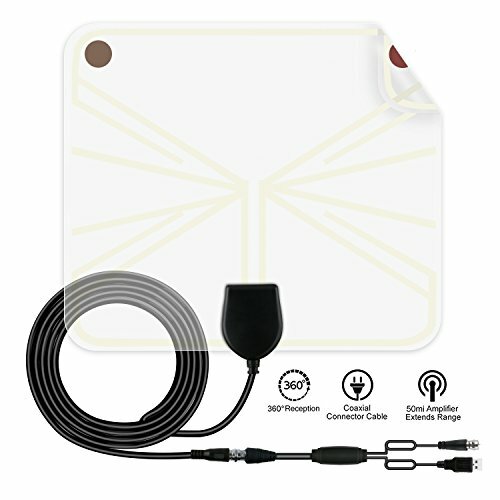 Ultra thin and reversible black and white indoor TV antenna. Clear Circuit Amplified Digital Signal - Amplified directly at the antenna elements, the amplifier is ultra-low noise with only 1dB (typical) compared to 3dB+ of noise from other antennas, giving you a crystal clear digital TV antenna signal. Free TV Programming - Free ota programming has more options and more channels than ever before. Watch local news and weather, live sports, and all the top-rated shows for free with an indoor amplified TV antenna. Pair the TV antenna with a streaming device for maximum HD programming. 50 Mile Range - Multi-directional amplified TV antenna delivers 50 mile range in both directions, giving you twice the coverage. Hang the indoor TV antenna on a window or wall, or lay the TV antenna flat on a table. 4K Ultra HD and ATSC 3.0 ready. If you have any questions about this product by wyne, contact us by completing and submitting the form below. If you are looking for a specif part number, please include it with your message.